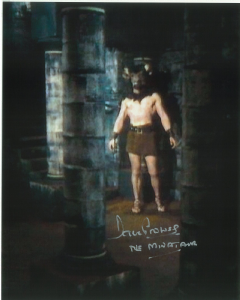 Dave Prowse played the Minotaur in the Doctor Who story The Time Monster. Outside of Doctor Who, the tall actor has a long resume of film and TV appearances, including playing no less than three different versions of Frankenstein's monster — two for Hammer films of the early 1970s, and once as a Boris Karloff-style monster in the 1967 spoof Casino Royale. His best-known roles, of Darth Vader in the first three Star Wars films, and as the Green Cross Man in a number of British safety PSAs.